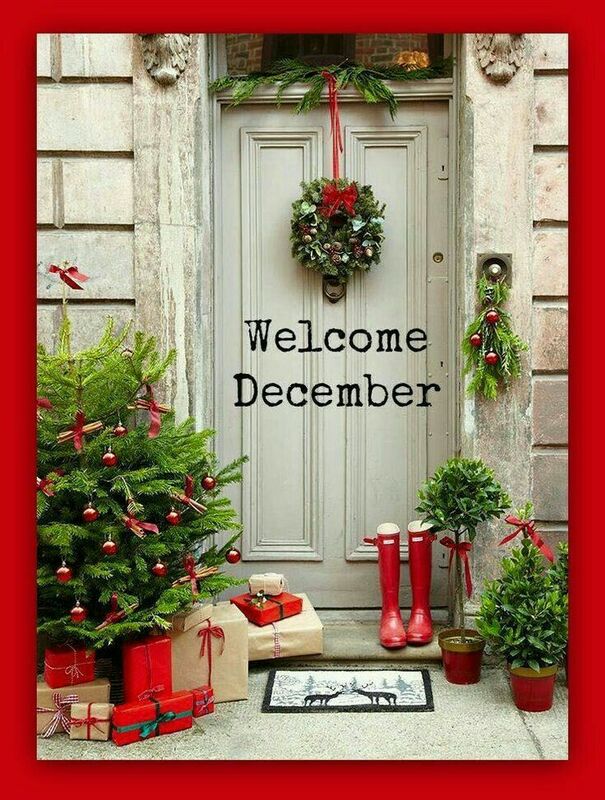 Welcome December…the month of memories and joy! What is it about Christmas that brings past memories to the forefront faster than any other month? There really is something magical about this time of year. It is also the time when churchgoers and non-churchgoers alike tend to experience strong spiritual longings. There is a deep yearning in all of us (as creations and children of God) for an experience to be fulfilled greater than anything our imaginations can conjure up in our minds. It is a time when our hearts demand more happenstances than our brains…we want something extraordinary to happen…something that changes our lives forever…something like time with our Creator. *Don’t forget to say “Rabbit” today. The combination of spirituality and magic this month shows up in the first of the month “Rabbit” photo. 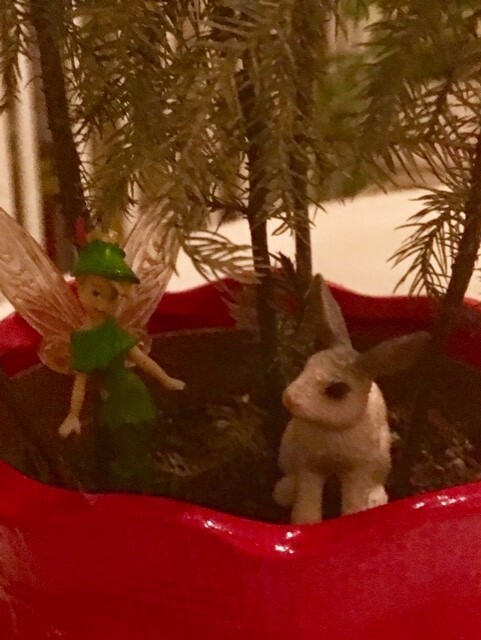 I discovered little Tinker Bell in last year’s Christmas’s little fir tree plant while looking over last year’s decorations (how it survived without watering I don’t know) so I placed little rabbit next to the most popular fairy….a combination of magic, luck, and the true essence of Christmas. Lucy, one of Anne’s sisters first sent me ‘”Little Tink” (Tinker Bell) for my garden several years ago. It got to be an on-going joke between us where I would lose Tinker Bell next. Tinker has ended up under cement benches, in a bird’s nest, and now in last year’s little Christmas fir tree planter. Here is an excerpt from the email I sent Lucy! I was pulling out some Christmas decorations from last year and noticed a little fir tree planter someone gave me for Christmas…it had been left out on a table in the back room and forgotten…no water…little light…yet it was still alive. And guess who was in it…Little Tinker Bell…she must have scattered her magical pixie dust over the plant to keep it alive. Anne took me for my doctor’s appointment yesterday. We were just ‘clicking’ along having the best time catching up until we turned off I-26 and got on 526. There had been a wreck and we were stuck in a slow-moving mobile “parking lot” that put us back about half-an-hour. Miraculously we had left early so we ended up only being about ten minutes late…it pays to leave early for appointments these days (with lowcountry heavy traffic a “given.”) One never knows what the roadways will surprise us with… on any given day. Even on frustrating ‘stuck in traffic’ days God continues to have a sense of humor. 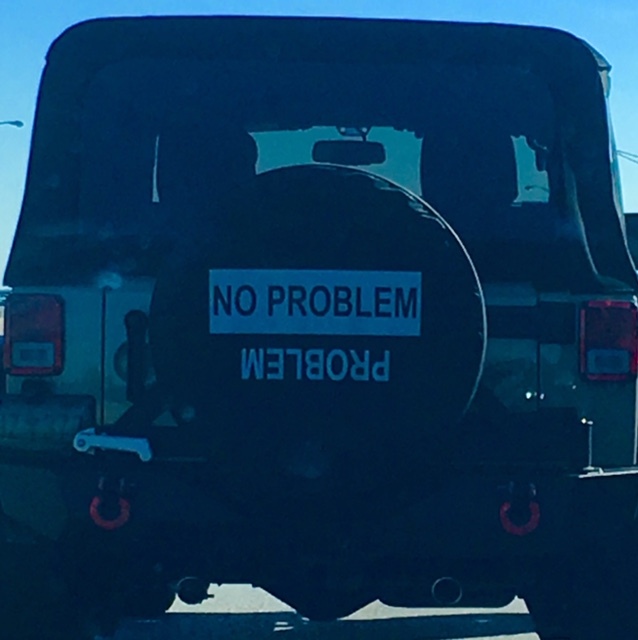 A jeep pulled ahead of us and as we read the phrase on the back of his vehicle we had to laugh….”No Problem…with Problem spelled upside down.! So until tomorrow…Let us never forget that December is the month for miracles, especially as witnessed by the birth of Jesus Christ. 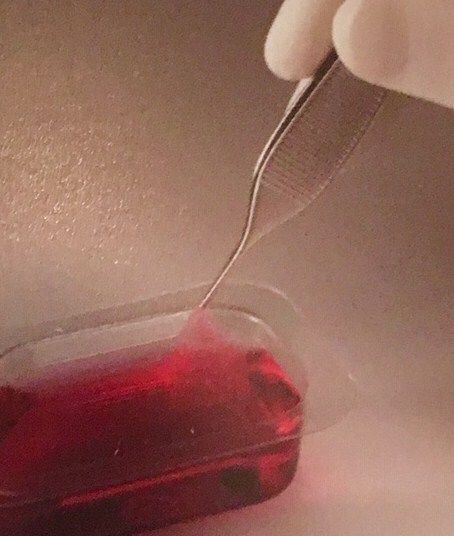 And every day miracles continue to be witnessed by people like you and me… For me…seeing modern day medicine as another miracle is bringing hope to many of us who would have had a much more difficult path to follow with breast cancer and severe wounds… only a short time ago.